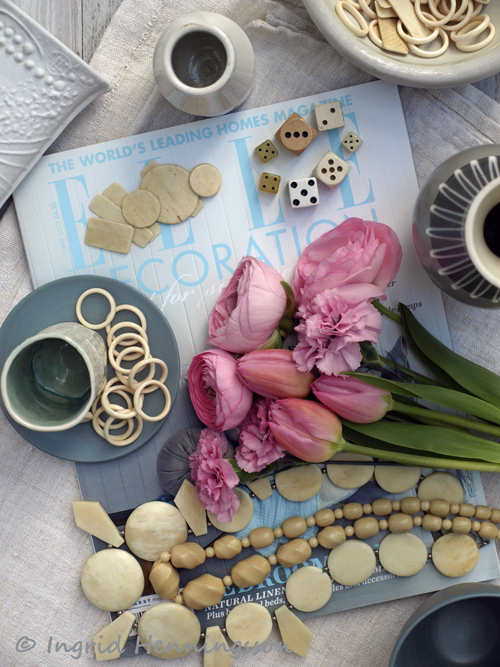 My inspiration for this weeks Floral Fusion comes from the June issue of Elle Decoration. There are some lovely features all with a light and summery feel to them. There are among others two homes from Copenhagen in Denmark and two chic Parisian apartments. A favourite feature is one about the Italian interior designer Enrica Stabile and her shop in Milan. I came across Enrica back in 2001 when she published her books Comfortable Country and Open Air Living - books that still sits happily on my shelf and I still find inspiring. I was very happy to see images of her collection of antiques and her shop based in converted saucepan factory hidden away in the backstreet of Milan. 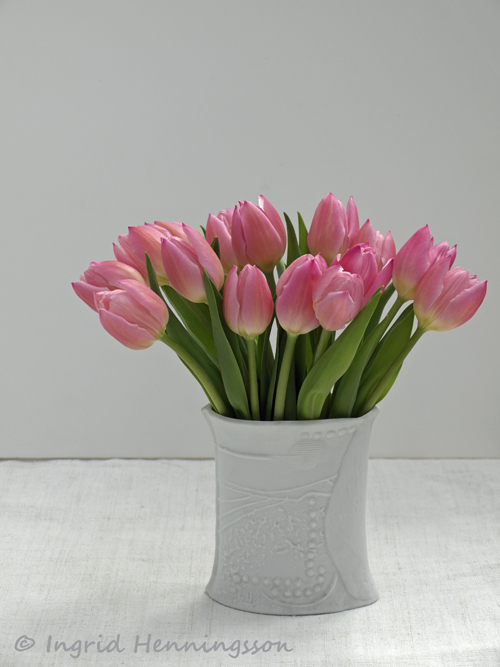 The collection of vases that I have used are all in the white and grey tones. The taller vase in the back is a Hornsea slip-ware vase made sometime between 1962 and 1973 - the stamp on the base identifies it from that time - I found it in a charity store not so long ago. In last weeks Floral Fusion I showed some red dice and joked about that I must come from a long line of gamblers - well here are some more white vintage dice. 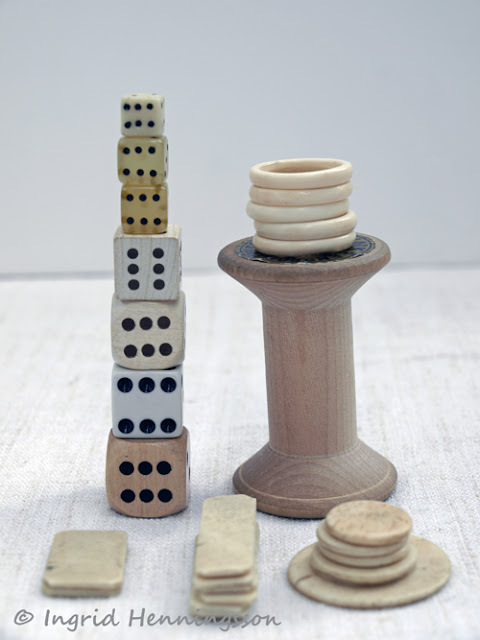 Maybe they weren't gamblers - people just played more board games back in those days. The round rings balancing on the empty cotton reel - are curtain rings and in the front are little piles of vintage game markers. 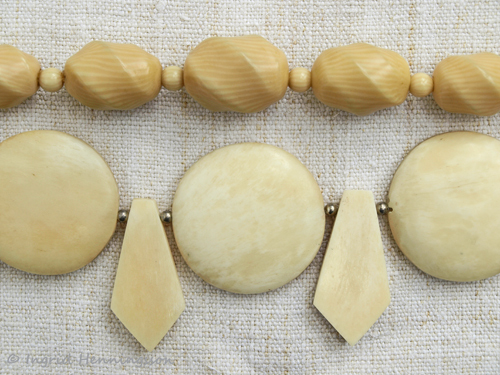 Two vintage necklaces - the bottom one is an Art Deco necklace and the top one is from around 1900. The fabric is a vintage French linen sheet - thick and very heavy - with a hand stitched seam in the middle and all the edges are also hand stitched. The seam in the middle tells you that it was woven on a narrow loom and then stitched together to make a wider sheet. 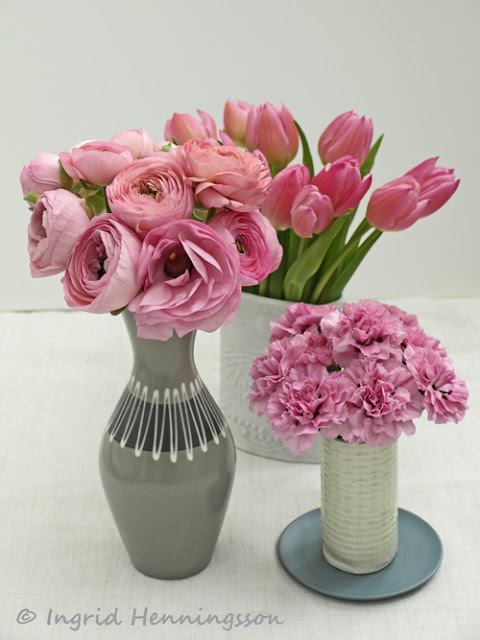 Three flower arrangements - all pink flowers but one type of flower in each vase - and then grouped together for more impact. 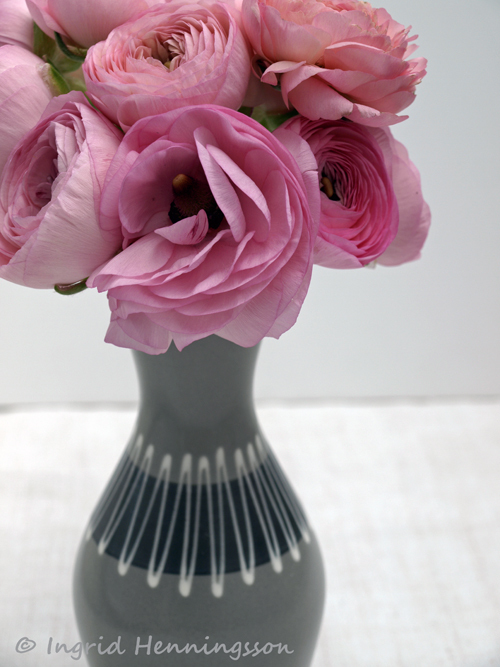 The pink Ranunculus makes a wonderful contrast with the grey 1960's vase. I love the dark band across the middle and the squiggly white lines. The pinks are massed together in a little textured handmade vase - the scent is fabulous! The tulip season has been longer then usual this year - spring came late and it's been so cold and I have loved having access to an almost never ending supply. These pretty pink tulips I put in a Swedish white ceramic vase with an interesting textured pattern made by the Swedish glass artist Bertil Vallien. 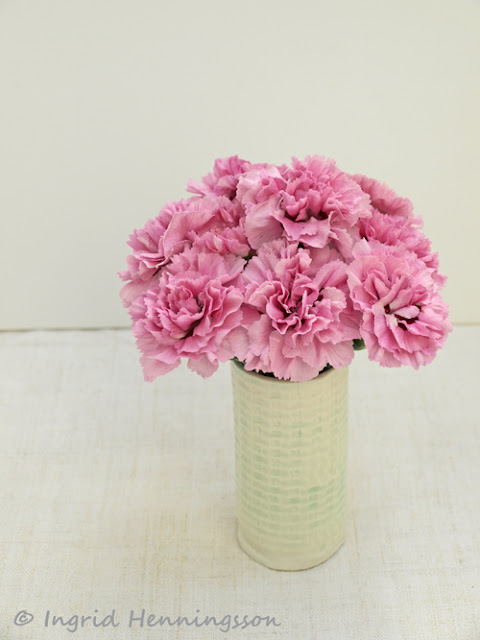 I'll be back on Sunday with a Florets - my Floral Quote by a florist or other flower lover. Grey and pink make a fine combination...I am always reminded of Whistler's paintings. 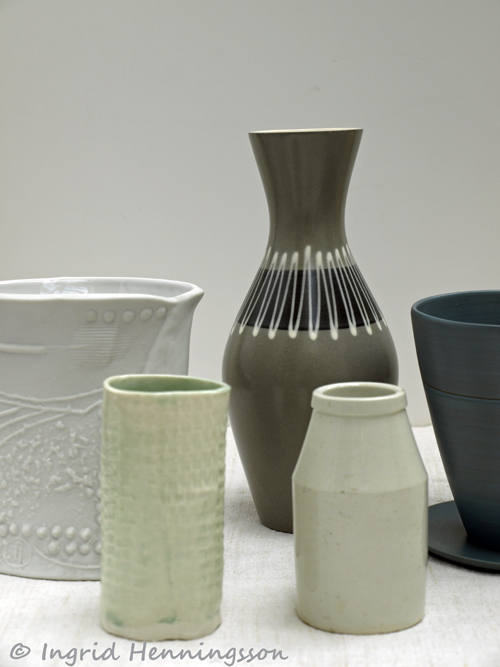 Your collection of vases reminded me of Giorgio Morandi, one of my favorite artists. I am so in love with the pink ranunculus in the gray vase. It is such a perfect color combination. Beautiful vases, beautiful flower arrangements.Pink is a perfect color! 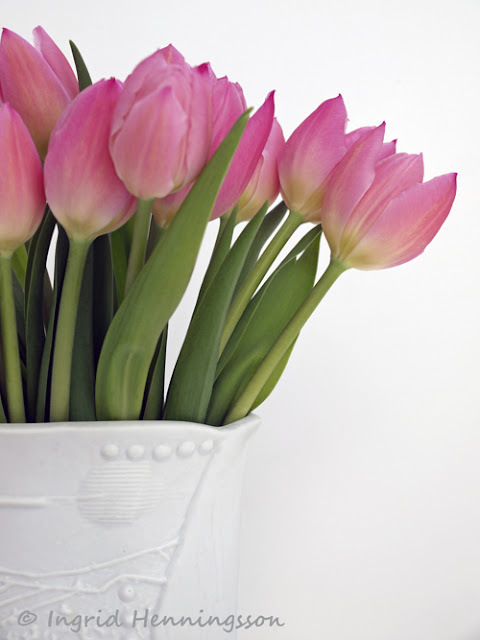 Your vases are very beautiful and well arranged. I like the combination gray/pink. Grey and pink are such a classic 50s color palette - I love that dark grey vase. 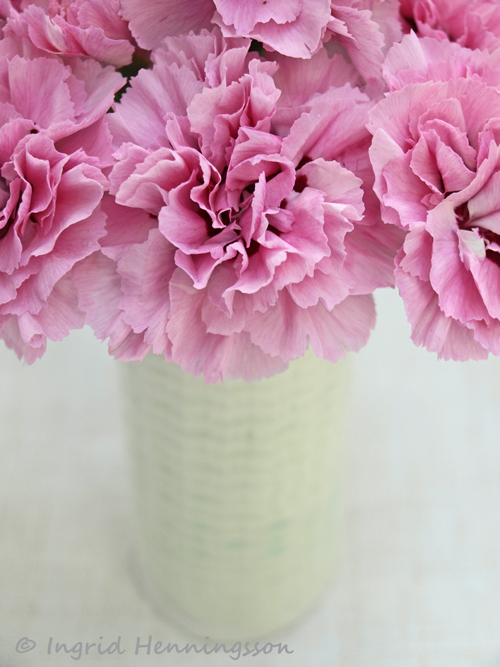 I have a lot of gray in my home - these arrangements would be perfect!